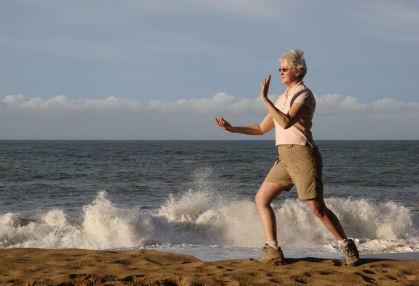 Tai chi for seniors is a healthy exercise that simultaneously relaxes and invigorates the body. Many individuals perform tai chi, also spelled t'ai chi, as an alternative to a more dynamic workout, yet still reap the numerous benefits associated with a focused approach to body movement. Tai chi has a storied history. The origin of the practice stems from ancient India and yoga. The Chinese modified yoga positions into a form of soft martial arts, otherwise known as internal arts. Similar to a hard martial art, such as karate, the movements of tai chi are rooted in a warrior stance. However, like yoga, tai chi combines the concentration of breath and movement to encourage the body to increase efficiency and relieve the mind of stress. Taoist monk Chang Sang Feng developed the foundation of tai chi in the 13th century, but as the practice grew, prominent Chinese families added their own movements and meaning to this internal art. Previously, there were as many as 100 different versions of tai chi, the most popular of which were Yang and Wu. Some variations of the practice exemplified a more hard martial arts approach, and during times of war, factions strengthened defenses through alliances with those experienced with certain forms of tai chi. Through the centuries, tai chi evolved into a more calming and focused body movement. Masters teaching tai chi today do not emphasize the differences as much as the core movements stemming from the original form. Tai chi is often referred to as "meditation in motion." "Tai" is a Chinese word that means highest. "Chi" represents energy, breath, and spirit. In Chinese medicine, it is believed that individuals can enhance both mental and physical health when the body's chi flows evenly throughout the body. The fluid but deliberate moves of tai chi for seniors improve inner awareness and unblock the flow of energy, among other benefits. Watch a video on Classical Tai Chi.com of two different tai chi sequences -- square and round forms, and internal discipline. Improve coordination, reducing the number of falls. Improve everyday physical functioning, which promotes independent living. Reduce arthritis pain, joint stiffness, and high blood pressure. Maintain a healthy bone density level to reduce breakage. Anyone interested in tai chi for seniors will be happy to discover that it can be practiced anywhere. There's very little risk of overdoing it, and there's no need for special equipment. However, like with any new exercise endeavor, it's best to check with your health advisor before trying it for the first time. Another advantage of practicing tai chi is that you can do it alone or with a group. One might enjoy a deeper calm following a solitary meditative practice. However, many other people will experience healthful socialization performing tai chi with a group of active seniors. Many hospitals, wellness centers, gyms, and senior centers, offer tai chi. Depending on the facility, there may be a nominal charge for a series of sessions, or tai chi is offered as a perk within a wellness package. Also, visit LoveToKnow Yoga for more information on alternative exercise, meditation, and healthful living.